My name is Elizabeth Bedford. I am 78 years old in this the year of our Lord, 1850. I guess you’re wanting me to tell what it was like when my husband Robert and I came to take possession of the land granted him by the British Crown for his military service in the American Revolution. My heart sank at the sight of the mighty trees whose huge trunks stretched to the veryheavens and whose canopy of leaves were so dense that the light of day could not penetrate to where we stood. At first I cursed the forest, its gloominess,its dangers — thieves and wild animals. I dared not let the children out of my sight for many an adult was known to lose his way. And oh, the work it entailed: felling these behemoths with a simple axe. But there was no choice. We needed shelter – first a shanty and then a small cabin. We needed fields and fuel to keep us warm and cook our food. And there in lies the blessing. I came to thank the good Lord for the many gifts the trees afforded us. Our very life depended on these trees – materials to make tools, utensils, furniture, fences, animal shelters, even food such as fruit and nuts. In time I came to appreciate the sheer beauty of the trees, the wonderful autumn colours and the delicate green of the budding leaves in spring. But by far my favourite was the dogwood tree. In full bloom it is a wonder to behold with its myriad white blossoms. They say that Christ’s cross was made of the wood from the dogwood tree. Indeed, the four white blossoms tinged with red resemble a cross. For me, after a cold harsh winter when supplies were low, the dogwood was an affirmation of God’s promise of rebirth, not only spiritual rebirth but the rebirth of the land on which we depended and the human spirit that worked it.The settlers had to cut down many trees to create homes and farms. However, we have continued the practice to the point few Carolinian forests remain in Canada. 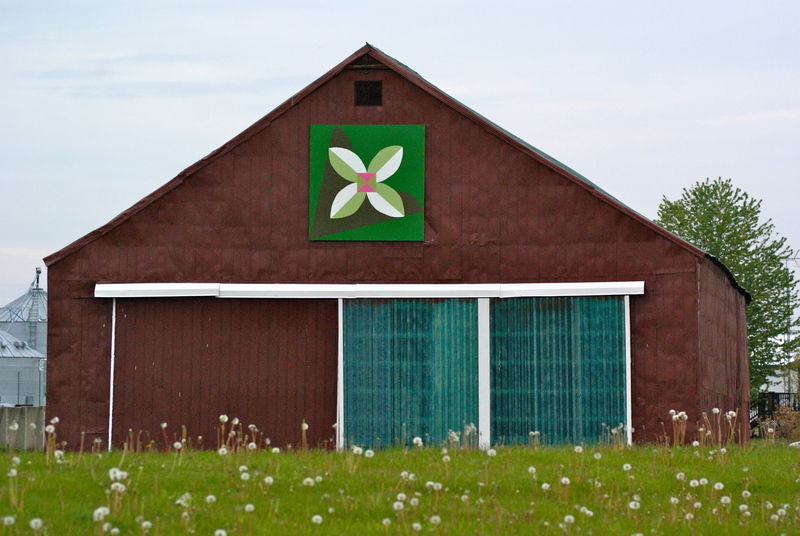 Posted on August 12, 2012, in Longwoods Barn Quilt Trail, War of 1812 and tagged Dogwood, Elizabeth Bedford. Bookmark the permalink. Leave a comment.